A paperboard tray former was used to package sterile medical supplies. Eagle Packaging Machinery recently helped a sterile medical supplies kit manufacturer automate its paperboard packaging. The customer had been hand packing its sterile medical supplies into paperboard trays and needed a more-automated process. The application, however, demanded careful machine handling. "Their box is beautiful," Anthony Del Viscio, vice president of Eagle Packaging Machinery, told Qmed. Because of the product's high-end look, "we could not mar the tray or its graphics in any way. We were able to show that we can erect the box delicately, without marring the high-quality graphics." The company's existing tray could not be modified in any way, Del Viscio added, so his team decided to customize Eagle Packaging's standard equipment for a solution. Eagle took its standard tray former PopLok and coupled it with an inserter, delivering what Del Viscio's says is "almost like two machines in one, all in one footprint." 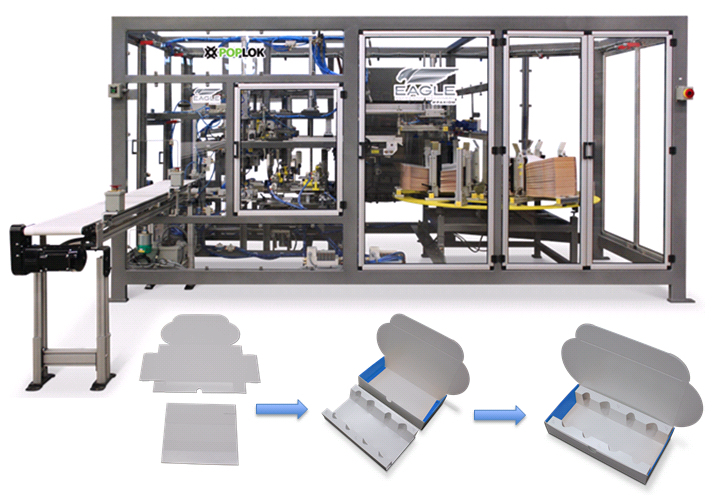 The new solution, which Eagle Packaging is now marketing as the PopLok Inserter, forms a fold-and-tuck style tray (from either corrugate or chipboard material), separately forms an insert from a blank and squarely forms it, and then places the insert precisely into the tray. The insert is used to separate fragile contents in the tray and secure them for shipping. No glue is used. The PopLok Inserter can form the tray and insert and combine them at a rate of 20 trays per minute, which is "fast for this type of tray," explained Del Viscio. "SBS blanks are very lightweight, so they're a challenge to handle." The system can also form these components delicately. "We pull the blanks down without a mandrel and handle them delicately, which is quite unique," he said. In addition, the unique handling does not mar the high-gloss graphics in any way, the company reports. And without a mandrel, operators can perform rapid changeovers without tooling. Del Viscio added that the system for the kit needed to operate in a cleanroom. Eagle Packaging had been accustomed such stringent requirements given its experience supporting pharmaceutical and food applications, he said. The PopLok Inserter also utilizes SMC and Tolomatic cylinders, either an Omron or Allen Bradley PLC, and a 7-in. color touch screen HMI allowing for user-friendly operation. Del Viscio anticipates future work with the customer. "We could also develop automation to insert devices into the package, and we can erect, load, and seal the package," he said. Don't miss the "User-Centered Design" sessions at the upcoming MD&M Minneapolis Conference and Expo, November 8-9, 2017.